If we’re really honest, we all lie to ourselves at one time or another. Sometimes we lie to ourselves to not hurt someone we love and sometimes we lie to ourselves because if we really looked at our “truth,” it might require us to make some choices that we may not want to make.These lies can be big or they can be small. In the past, from old habits, Susie has kept some bits of information from Otto so as not to hurt his feelings and it’s only backfired on her. scenario was much worse than what actually happened. The lie she told herself was that holding back the truth was easier than telling something uncomfortable to someone you love. Many couples put their intimate relationship behind everything else when they set priorities for their lives. You have to decide that the relationship is important in your life and give it the time and attention it needs. As we’ve said before, it doesn’t matter what you say or intend about your relationship. Your actions are what speak the loudest. Tip: Look at your actions in your relationship and make sure that they are congruent with what you say your intentions are. Are you spending enough time and energy on the relationship? The problem with this lie is that we truly do get more of what we focus on. So if we focus on what we don’t like, we just get more of it. For evidence, just look at what happens in your life! Tip: Stop when you start to criticize with words or even in your mind. Turn your thinking to what you like about the person and begin to see how your relationship gets better. Very often, people in relationships treat the people closest to them worse than they treat acquaintances or even total strangers. They think that because a person “loves” them, they can say or do whatever they want. We’ve found that this is exactly the opposite of what needs to happen to feed and keep love alive. One of the biggest lies we tell ourselves is that when we get into a committed relationship is that we can leave appreciation at the door. Appreciation should be understood. Right? You may be thinking that you need to say “thank you” and just haven’t taken the time or energy to do it. We urge you to make a habit of expressing appreciation. If you do, you’ll find your relationships to be filled with much more happiness and joy. Most people expect the people who are in relationship with them to be mind readers. If you’re expecting others to be psychics, you’re in for a painful ride if you’re in relationship with them. If you want your needs to be met, you have to tell people what these needs are. You also have to tell them in a way that they can hear them. Sometimes this takes courage, but we know that when you clearly ask for what you want, you bypass assumptions, resentments and miscommunications. 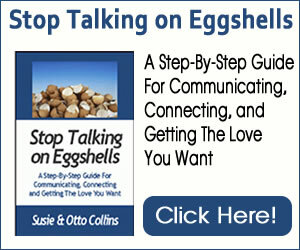 Tip: What desire have you been putting off communicating to another person? Whether it’s a desire to have more “dates” alone, more romance, more help around the house, a promotion at work, or a dinner date with a friend, the only way you’ll get any of these things is to ask. Be open to the possibility that someone else’s opinion or way of doing things may be just as valid or important as yours. Just because their way is different, doesn’t make them or you wrong. If you’re constantly judging, being defensive and building walls, you’re not open to possibilities and to the love that is possible between two people. Tip: Choose someone who always seems to push your “buttons” and makes you angry or you always judge. During one conversation, just listen to this person without judging them with words or even in your mind. We can be in a relationship for many years and still not allow another person to penetrate our walls of protection. If you want to have relationships that are alive and growing, being willing to risk is a prerequisite. Tip: Examine what walls you’ve built to keep others out. It might be that you “close down” and retreat when there’s conflict between the two of you. take a risk and say one thing that is real and true for you to this person. These 7 lies are not the only ones that prevent you from having a relationship that’s alive and growing but understanding not believing them is a good place to start.